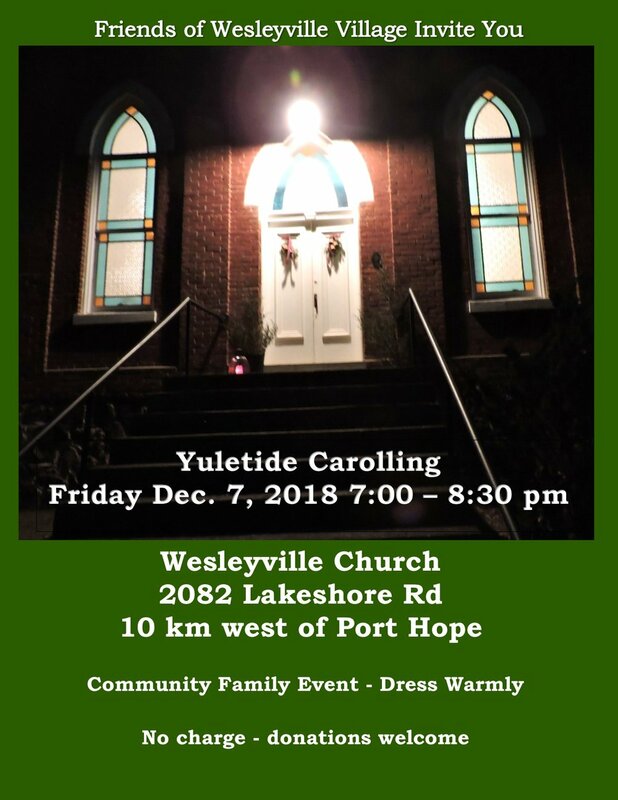 Described by many as their favourite event of the Christmas season - YULETIDE CAROLLING at Wesleyville on December 7th will be led with joy by Randy Mills and feature Juliette Sinnott on her harp. The harmonium has been tuned by Graydon Bowman and Kathryn is adding the seasonal decorations. Call Kathryn (905 753-2196) or Sue (905 885-1344) if you'd like to contribute some treats. You might also consider bringing a cushion for the pew and your membership renewal for 2019. Here's the details (click this link):Who are the "Friends"
The Friends of Wesleyville Village is a non-profit corporation of over 150 members who share a vision of preserving and revitalizing this heritage community for 21st Century uses.